Stash Less Challenge - Let it go...Let it go! The series where we talk about having a thoughtful stash. Stash Less last week meant taking stock of my stash, and as part of that I looked for sweaters that were sitting in my cupboard as "monuments to learning". What I mean by that are sweaters I have knitted that don't fit, or are the wrong style, and I don't wear. For some unknown reason quite a few of them have been sitting in my cupboard for a long (long long) time. Some of them have been there for years. I wrote a blog post early on in my blog life called how to choose a sweater pattern, which details many of the mistakes I have made over my life of sweater knitting. My hope is that it has helped you avoid some of your possible mistakes. Many of these ill-fitting sweaters have been donated to other happy recipients with different body shapes than me, but in the process of taking stock I realised that I have at least four sweaters sitting in the cupboard. I have no plans of ever wearing them. I haven't worn them for years (ever) and yet I keep them. Which got me to thinking about why I haven't ripped them out. The jumper in this post was one of them. The thing was it didn't fit. It has never fit. The photos kind of make that clear don't they. The sleeves are 17inches wide - normally I like a 12ish inch sleeve - that's 5 inches of ease. That is correct 5! Not really ideal. And the body makes me look like a barrel. Again not a good look for me. But for some reason I've kept it. As part of my research for this blog post ;), I just checked on Ravelry for the date I finished it and what I found makes me feel a little bit embarrassed. Yep - it has sat there for over FIVE years. How nuts is that. Why would I hold on to something that I know has no purpose, and in many cases no beauty, unless they are simply monuments to learning. Monuments to learning aren't that useful. The lessons I have learned are contained within my knitting memory and I take those lessons with me into each new project. A physical reminder is unnecessary, yes? Worse that that - looking at them makes me feel bad. If I tune in to what I feel when I look at them, there is a mixture of annoyance that I got it wrong, frustration, horror, avoidance and misguided hope of the "if I try it on again it might not be that bad?" variety. Maybe it is simply avoidance of those feelings that means that I don't look at them or deal with their existence. Why would I want that in my life? Why would I want to hold on to those feelings? Why would I not just let it go? Is it just that I am avoiding the process of ripping it out? Why not just address it and get it done. And really how bad could it actually be. I mean really. In the words of a wise woman I know called Andrea "why are you holding on to something that no longer serves you". Or for those of you with small children/nieces/nephews, in the immortal words of Elsa - "Let it gooooooo, let it goooooo…." Have a look through your knitting discography and find something you never wear and is a monument to learning. Pull it off the shelf and rip it out. Simply take it out of the cupboard, sit down with a glass of wine and a pair of scissors and unravel it. Sing along with Elsa if you need to. But get it done. I promise you it will be cathartic and joyful. 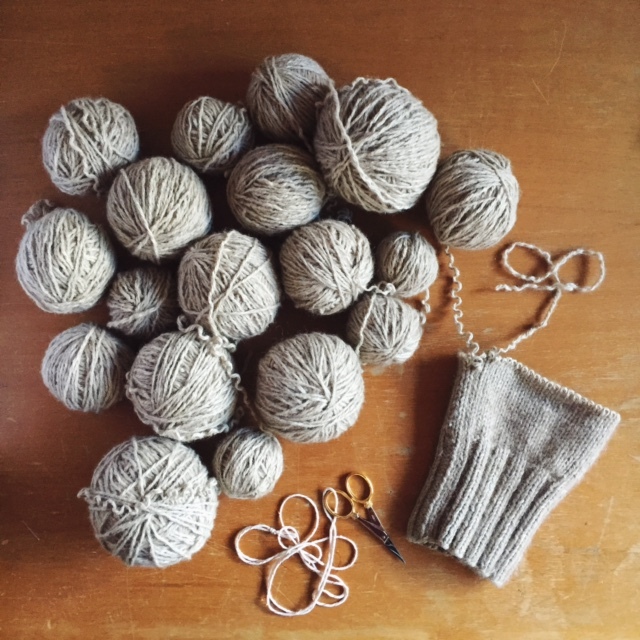 I cannot tell you how good it feels to see all those balls of yarn wound up, ready to go out into the world and embody the lessons you learned through knitting it in the first place. Get it done by November 10th, take a photo and hashtag it with #stash_less_ripping. I'll find something ace to send one lucky person chosen at random. Or if you aren't on instagram etc just leave a comment if you are taking me up on my challenge. I'm not sure I'll have any takers at all on this one ;)…..but i'm hopeful. PS. You can see other posts in this series by clicking HERE.